The start of November means one thing – it’s time to celebrate Wovember. The Wovember campaign was started in 2011 by knitwear designers, Kate Davies and Felicity Ford, as a response to frustrations at the misuse of the words ‘wool’ and ‘woollen’ in garment descriptions, meaning that consumers often didn’t know what they were buying. Wovember is continued today by Felicity and Louise Scollay, author of the KnitBritish blog and podcast with their aims being to recognise and celebrate wool heritage, educate the wider public about what constitutes wool and to campaign for clear labeling and clarity through trading standards. These issues are also important to Baa Baa Brighouse and Wovember provides an opportunity for us to highlight them and demonstrate how we support and advocate the use of ‘proper’ terms in our own business. From the outset, Baa Baa Brighouse has sought to establish itself as a British yarn specialist, offering predominantly 100% wool and wool rich yarns for sale as well as using a high percentage of wool in the garments we produce. By wool, we mean yarn that has been grown on the back of a sheep – not viscose, acrylic, nylon or other man made fibre. Whilst we recognise that these fibres have their own role to play in the textile industry, wool is a premium yarn, which takes time, toil, effort and dedication to produce. From the birth of a lamb, to the shearing of an adult sheep’s fleece, imagine how much care a shepherd or a farmer has to show the animal before it is shorn. Then of course, there is the whole washing, carding, dyeing and spinning on top of that – a process made more labour intensive if the wool is hand dyed, hand spun or hand knitted into the finished product. We believe it is vitally important to support and protect our wool and sheep farming heritage – just one of the reasons why we choose to stock Herdy wool. It’s a 100% British yarn and the Herdy brand funds and sponsors projects through the Herdy fund, which supports upland fell farming in Cumbria and the region’s iconic Herdwick sheep. Laura’s Loom, based in Sedbergh in the Yorkhsire Dales, can even point to the very sheep in the field from which the yarn comes. 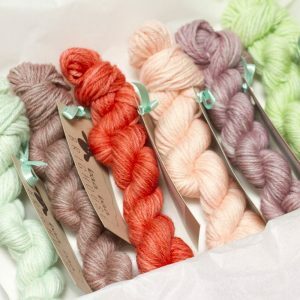 Our monthly subscription yarn club, the Yan Tan Tethera Club, is all about Yorkshire yarn. Our dyers use wool rich British yarns, often reared, sheared and spun right here in Yorkshire before being dyed by hand. Not only does this support small, independent, cottage industries but the wider wool industry of Yorkshire too. It seemed an obvious step to take when we considered launching our own brand of hand dyed yarn that we would use a 100% British Bluefaced Leicester. It’s a sheep that is common to these parts and is spun locally before being dyed by hand, using traditional methods, here at Baa Baa Brighouse HQ. 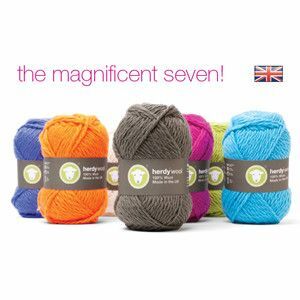 We’ve always advocated transparency when it comes to the labeling of our products – when you buy Baa Baa Brew yarn, you get just that – 100% British Bluefaced Leicester wool. Not only that, if you look at our handmade garments, you’ll also find everything clearly labelled – right down to the percentage of fibre variations used and if it’s a Yan Tan Tethera original, we’ll even tell you the month in which the yarn was dyed and the name of the dyer. We’re starting our Wovember celebrations by offering our customers a generous 15% off across the store throughout the month. We encourage you all to engage with us on Facebook, Twitter, Google+ and Instagram and tell us why you love wool and what Wovember means to you.